If a fundamental goal of education is to prepare students to act independently in the world—in other words, to make good choices—an ideal educational assessment would measure how well we are preparing students to do so. Current assessments, however, focus almost exclusively on how much knowledge students have accrued and can retrieve. 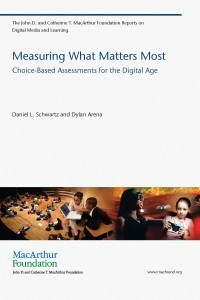 In Measuring What Matters Most, Daniel Schwartz and Dylan Arena argue that choice should be the interpretive framework within which learning assessments are organized. Digital technologies, they suggest, make this possible; interactive assessments can evaluate students in a context of choosing whether, what, how, and when to learn.